My Link to the Past: Growing by Leaps and Bounds! Today I was working my way through my Geni Tree Matches. These matches are usually not valid matches. Sorry Geni, just saying it like it is ;) I usually use the invalid matches to show me where I need to add more information to my profiles to improve matching. Today's e-mail had 5 new Tree Matches for me. The first one I was unable to really add much to. The second one I was able to add a bunch of relatives to my daughters ancestors. The third one though was an amazing breakthrough. Sadly, the match was not at all valid. The "matching" profile had different parents, and a different birth date etc. As is my usual custom, I went to add more to my profile of John G Bowman. In the process I looked at his father, William W. Bowman (my husbands 3rd great grandfather) and Ancestry gave me a hint I could not ignore. The hint was for a 1901 Canadian Census record in Vancouver, BC. I didn't expect this hint to pan out, as I had no reason whatsoever to suspect that William and his wife Sarah had left Ontario, where they had immigrated to from England with their children. Yet, when I looked at the census entry, it did look promising. William Bowman was born in Scotland, and his wife Sarah was born in England. And he was a tailor....and they did have a son Thomas who was born in England about that age....But.... "our" William didn't have a daughter Ada born in Ontario in 1872? Still, there were enough similar facts to cause me to look further. It seems a William Bowman died 6 Jul 1903 in Vancouver who was born about 1837. Now I am fascinated, because I find that he was buried in Mountain View Cemetery. This is very interesting indeed, because I have actually been to this cemetery, although it is across the country from where I now live. The man I was originally told was my father is buried in Mountain View and when I lived in the Vancouver area a few years ago, I went there with my husband on two occasions, one for my step fathers mothers funeral, and once to visit the grave of my "father". Findagrave actually has a photo of the stone for William and Sarah. Sarah had died in 1907 in Vancouver. So, I check Mountain View at Findagrave for other Bowmans, and find Thomas there as well. Apparently he had married a Charlotte Ruxton Carswell in 1891 in Michigan. So I checked FamilySearch and indeed the marriage lists his parents as William and Sarah "Dunning" Bowman! Findagrave also links me to her parents and also a daughter of Thomas and Charlotte, named Alma. By now, I am so excited I nearly wake the baby. Sadly, there is no image available for the deaths of William, Sarah or Thomas in BC. I will need to acquire those. And still, who the heck is ADA? 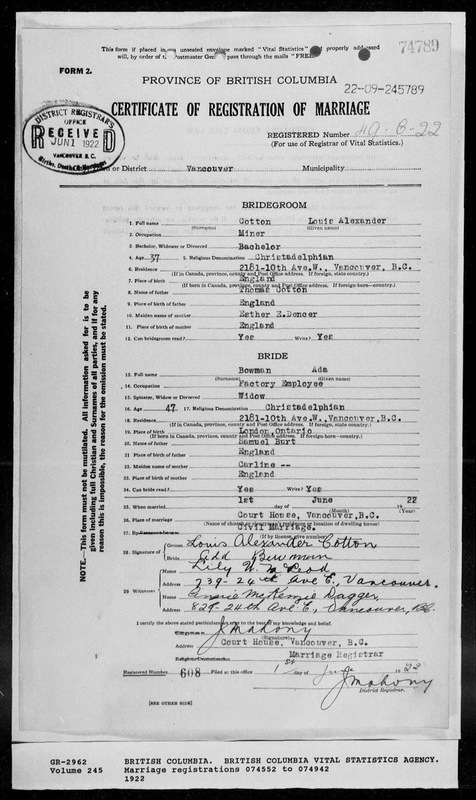 I am able to find the birth record for Alma Lillian Bowman in Ontario, 26 Feb 1897 in Essex County. This lists both parents. Alma Lillian Bowman married Robert Edward Neighbour on 28 Jan 1930 in Vancouver, BC. And this time there is an image! I see....so she was a widow, maiden name of BURT. Seems likely that she was married to a Bowman son of William and Sarah, who died before the 1901 census. I then search Ancestry for an Ada Burt who married a Bowman and I get a marriage in Ontario in 1899 of Ada Burt to Charles Bowman. Ada is listed as the daughter of Samuel Burt and Caroline Jackson, and Charles is listed as the son of William Bowman and Sarah Friendship. Huh? What? Sarah Friendship??? I can only guess somehow her stepfathers name Winship because Friendship somehow. Charles is 25 in this marriage. So, this would appear to be Charles Winship Bowman. But why is Sarah listed as Friendship??? His birth record lists that his mother is Sarah Dinning. Interestingly, there is a death index record for a Charles W Bowman, born about 1875 who died in Vancouver 21 Oct 1917. No image again! And we do find Ada, a widow, with her widowed mother Caroline in Vancouver in the 1921 Canada census. She has a 20 year old son (indexed by Ancestry as Wai H. Bowman, yes indeed, Ancestry you are the indexing gods....) named Wm. H. Bowman, born in BC. An Ada Cotton died age 66 in 1944 in Vancouver (no image). 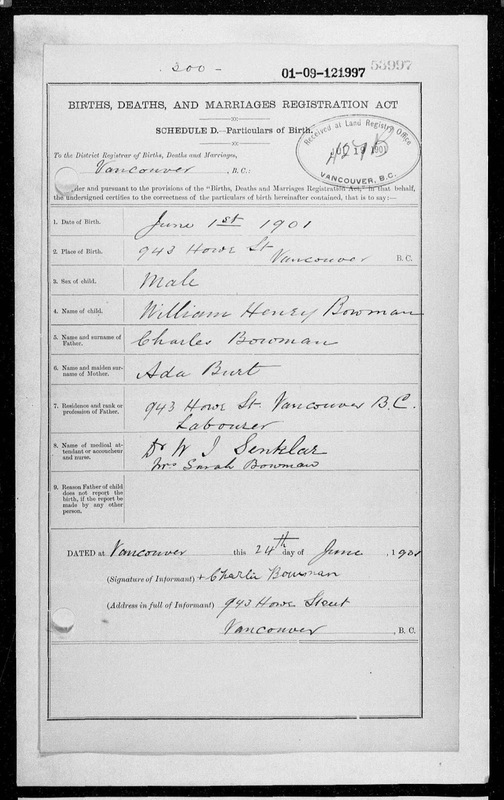 And then there is a birth index entry for William Henry Bowman, born 1 Jun 1901 in Vancouver. There is also a death index entry (no image) for William Henry Bowman, age 25, died in Vancouver, BC on 26/07/27. And guess where he is buried....yep, Mountain View in Vancouver! 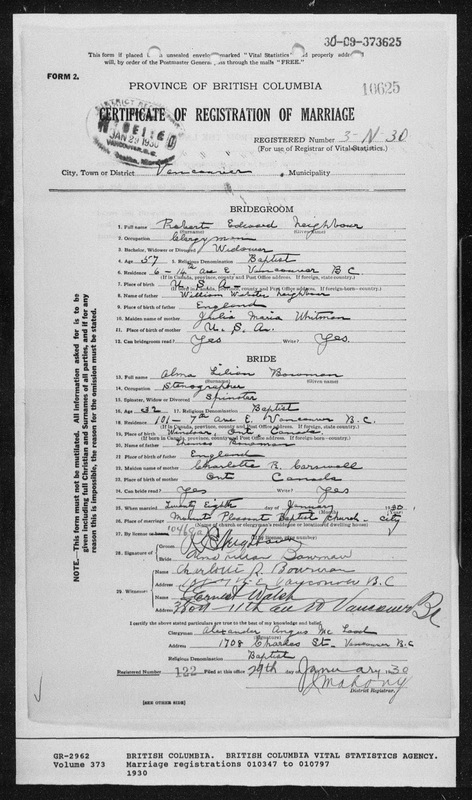 birth record of William Henry Bowman,, 1901, BC, Canada Notice the name Mrs. Sarah Bowman in section 8. Now onto Sarah Dinning....I had previously had her as a daughter of Irving Dinning and Catherine (last name unknown). She appears in Gateshead, Durham, England, age 3 in the 1841 census of England. The others in the household where Catherine, 34; Thomas, 12; Elizabeth, 10; Eleanor, 8; John, 5 and Irvin, 1. There is a baptist for Newcastle Upon Tyne, Northumberland, England on 24 Nov 1838 for Sarah Dinning, daughter of Irving and Catherine Dinning. In the 1851 census she is listed as Step daughter, with her brother Irvin Dinning, age 10, born in Gateshead, Durnam, in the household of William Winship (age 60), his wife Catherine, age 43, and his two sons John, age 29 and Thomas, age 19. They were all living at 43 East Row in Seaton Delavel, Northumberland. Things get even better now, because I find a marriage record for Catherine Dinning to William Winship in All Saints, Newcastle-Upon-Tyne in Northumberland and it lists her father as John Crooks!!! So we have a maiden name and a father for Catherine...I am super excited now, that is a maiden name for my husbands 4th great grandmother! And a name for his 5th great grandfather!!! WooHOO! Now it gets even better because I find a baptism in Newcastle-Upon-Tyne for Catherine Crooks on 11 Jan 1807 daughter of John Crooks and Elizabeth Hudson. So thats a 5th great grandmother too! But can I be sure this is her? Well, the 1841 census supports it, because Elizabeth Crooks is living with Catherine Dinning!! Notice also George Dinning, age 21 and Sarah age 20. We'll get back to them.. There is a burial of an Elizabeth Crooks, age 76, on 20 May 1850 in Gateshead, Durham, England. So it would appear John Crooks died before 1841 census. There is a birth of a Jno. Crooks to George Crooks baptism 10 Jul 1765 in Gateshead, Durham, England. Is that a 6th great grandfather for my husband??? Now back to the Dinnings....There is a baptism for a Irving Dinning in Northumberland to Thomas and Elizabeth Clark, born 18 Feb 1807. There is a marriage of Irving Dinning and Catherine Crooks 20 Jun 1829 in Longbenton, Northumberland. Thomas Dinning and Elizabeth Clark are possibly new 5th great grandparents for my husband. And then the fun really begins, because there is already Thomas Dinning/Elizabeth Clark on the Geni tree....and yet another person with Mary Coxon/William Dinning and then yet another person, no make that 2 or is it 3 down the Australian!! branch. So we have Monika and Annette, Pauline, and Derek to work with on this tree branch at Geni. Now back to more modern and closer lines. Alma Bowman was with her uncle John G in 1901 which tells us he had a wife "Marguerite|" and daughter "Gladis".